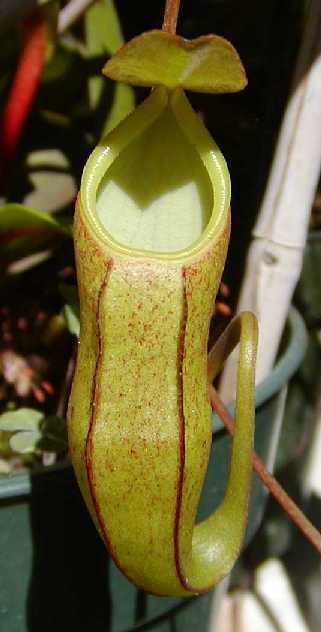 Nepenthes pectinata is closely related to N. xiphioides and N. gymnamphora so I'm told. I've seen some photos that appear different than mine so there must be some variation with this species. It is a somewhat small, scrambling vine that wraps its tendrils around bamboo stakes that are in the pots to support the plant. The Exotica Plants clone had always produced the yellowish pitchers for the longest time so I thought maybe my plant was something else. Finally a nice lower pitcher was produced that surprised me. 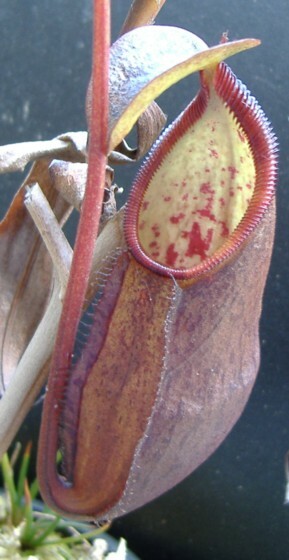 I didn't even see it because it was buried beneath some leaves of my other Nepenthes. I was blown away by the color difference from the upper pitchers. It definitely has red blotching with striping in the peristome. Quite nice! Before this lower pitcher was produced, I didn't think much of this species but not anymore. I have another N. pectinata called a "purple" that I purchased from a private grower. He said this purple variety originated from another grower from whom he got a cutting. Exotica Plants offers a N. pectinata "purple" but they don't have a photo of their plant. It is possible that this clone is cutting from one of Exotica Plants stock. 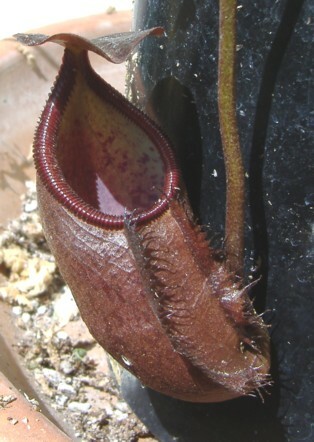 The lower pitchers are almost a "purple" color while the uppers are yellowish. Both plants readily produce basal shoots but I haven't tried taking many cuttings yet to see how they root.